In November, 1879 a gang of young bushrangers led by Andrew Scott (Captain Moonlite) attacked MacDonald’s farm at Wantabadgery Station, holding the occupants captive for two days and nights. After eating and drinking, the gang moved to a nearby pub, The Australian Arms Hotel, and more hostages were taken. Eventually one of the captives, Alexander MacDonald, escaped, rode to Wagga Wagga and alerted the police. A party of mounted police were quickly dispatched to the area & arrived at 4am and a gun battle ensued. During a lull in the shooting, while the police retired to await reinforcements, the gang managed to escape. They then rode to nearby McGlede’s Farm where they again took siege in the farmhouse from the increasing numbers of police who attended from as far away as Gundagai and Adelong. Again a shootout ensued between the two sides. At one stage, one young offender, Gus Wernicke, moved into the yard in an attempt to shoot the police horses and was quickly shot to death. In a further exchange of fire another bushranger, James Nesbitt, was also shot and killed by Senior Constable Webb-Bowen. During this last exchange, Webb-Bowen was also shot in the throat. This wound also proved to be fatal. At the trial of Scott and his gang for the murder of Constable Webb-Bowen, Mr. Justice Windeyer concluded sentencing by informing him that “Fortunately, your career of crime was promptly cut short by the courage, the vigilance, and the energy of our police, who are entitled to all praise from every man in the community for the prompt manner in which they arrested and brought you to justice. You young men have had an appeal made on your behalf. But I cannot forget that most of the cruel as well as some of the most bloodthirsty crimes which have been committed by the bushranging class in this country have been committed by young men like yourselves, and the question in your case is — what is mercy? Not only to you, but to the youth that are growing up amongst us; and I have been pained to find, through a long experience in our criminal courts that crime amongst our young men is becoming far more frequent than it was. The recommendation in your favour, of course, I will convey to the Executive, but I would remind you that the shadow of death is upon you. Whether it will pass away is not for me to say. The victim of your murder, shot down by you, when in the execution of his duty, will live in the memory of all who admire devotion to the cause of duty and manliness, whilst your fate will only give an additional warning to the reckless criminal that the way of transgressors is hard, and that a felon’s death and an ignominious grave await those who commence a career of crime. It is useless to moralise further on your case. The senior constable was born in 1851 and joined the New South Wales Police Force on 11 March, 1875. At the time of his death he was stationed at Gundagai. TWO Riverina police commands will honour the “Hero of Wantabadgery” – one of their own killed in the exchange of gun fire more than a century ago. 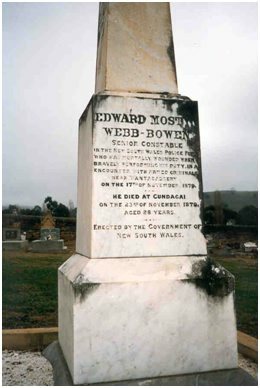 Senior Constable Edward Mostyn Webb-Bowen, known as Edward Bowen, was shot in the neck and died on November 23, 1879 as a result of the wound he sustained. Now, the Wagga and Cootamundra local area commands (LAC) are working together to restore his grave at Gundagai cemetery. Staff from the Wagga LAC will meet with Wantabadgery residents on February 1 to discuss ideas regarding a plaque, headstone or statue to honour Sen Con Webb-Bowen. Wagga police duty officer, Inspector Stephen Radford, labelled the police-led community project – headed by Constable Max Burmeister, who resides in Wantabadgery – as exciting. “We hope to raise awareness about those who were defending our community and values at a time when bushrangers were a real threat,” Inspector Radford said. “Unfortunately history has tended to forget the true heroes of this era and instead the names of outlaws such as Captain Moonlight and the Ben Hall Gang, (which are) responsible for the deaths of police officers, hold more recognition than those that did the right thing. Inspector Radford said the project aimed to help change the imbalance. Senior Constable Webb-Bowen’s death came after Captain Moonlight and his gang held up Wantabadgery Station one evening in mid-November. A number of people were taken hostage, and that number increased when the gang moved to the nearby Australian Arms Hotel. Officers from Wagga police arrived in the early hours of the morning and gunfire was exchanged. They retreated, waiting for reinforcements from Gundagai, and later visited a farm nearby where they found Captain Moonlight and his gang. For further information about the project, email waggabowen@police.nsw.gov.au or call Wagga police on 6922 2599. I hope in their restoration of Webb-Bowen’s gravestones they do not clean them with acid as one Gundagai group did to the old marble stones in Nth Gundagai cemetery in 2002. Acid melts marble as well as cleaning it. One hundred year + graves stones at Gundagai cemetery were made all sparkling white for the 2002 Gundagai 1852 Flood 150 years commemoration.. No matter the honing was taken off the marble and also the patina of age in the interests of having sparkly white gravestones to present to visitors. One interesting aspect of Moonlite the bushranger was the connection to the Irish ‘Whiteboy’ movement that Charles Sturt was so disgusted by. ‘Moonlite’ was also an Irish culture hero but that Moonlite was not Wantabadgery’s Moonlite though the Wantabadgery Moonlite may have been modeled off the Irish one. That rarely gets mentioned and neither do the Ribbon Boys of this area. Hero of Wantabadgery – Senior Constable Edward Webb-Bowen honoured. 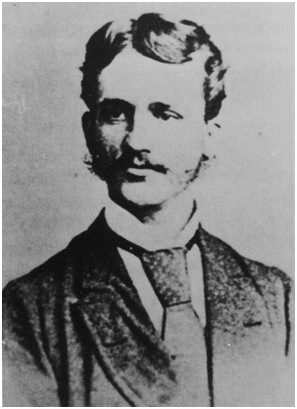 Wagga Wagga LAC – NSW Police Force, is honouring the ‘Hero of Wantabadgery’ Senior Constable Edward Mostyn Webb-Bowen who died in an exchange of gun fire in November 1879. During an evening in mid November 1879, ‘Captain Moonlite’ and his gang held up Wantabadgery Station and took a number of hostages. After eating and drinking, the gang moved to a nearby pub, The Australian Arms Hotel, and more hostages were taken. At 4am, officers from Wagga Police arrived and gunfire was exchanged with the gang. Officers retreated and waited for reinforcements from Gundagai. On arrival of Gundagai Police, the officers attended nearby McGlede’s farm and found ‘Captain Moonlite’ and his gang. Shots were exchanged and Senior Constable Webb-Bowen was shot in the neck. On Sunday 23rd November 1879, Senior Constable Webb-Bowen, known as Edward Bowen, died as a result of the gunshot wound. 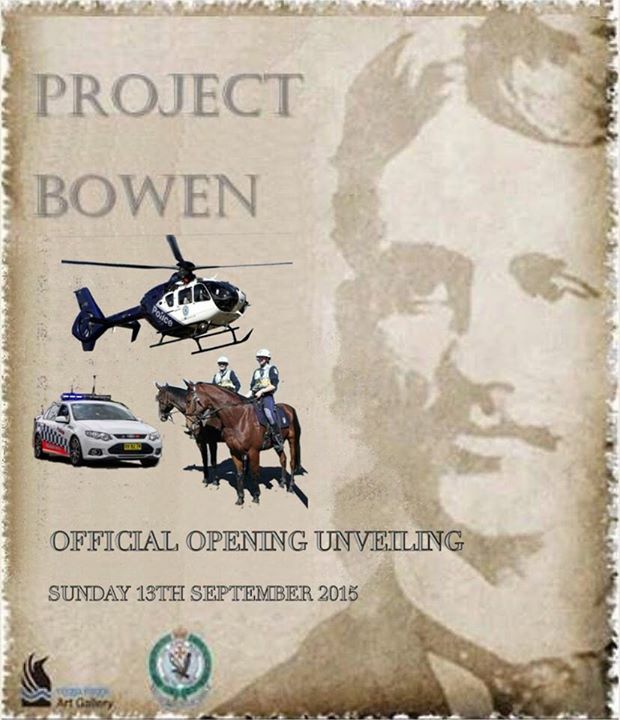 Project Bowen, was established in 2012 by the Wagga Wagga Police and Wantabadgery community to raise awareness and funds to build a monument to remember Bowen. 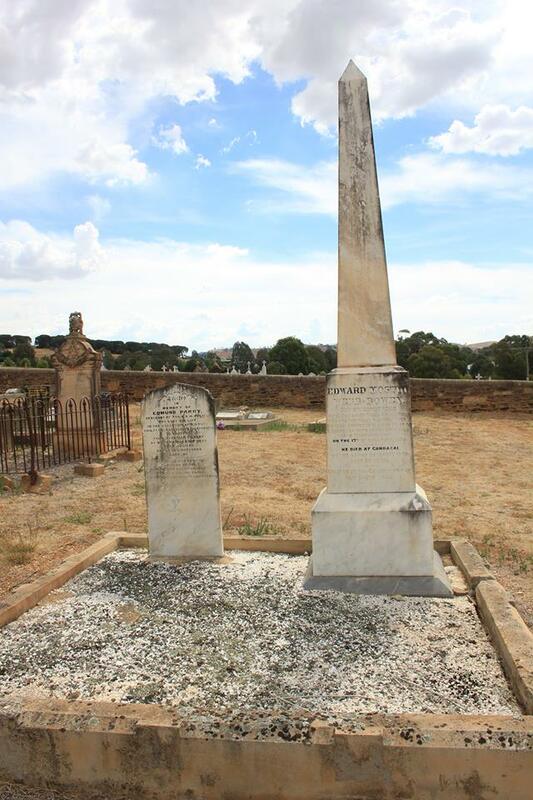 Following an, archaeological survey, art exhibition, art auction, generous donations from individuals and local businesses the monument was completed His grave in Gundagai was also restored. The monument now proudly stands adjacent to the Wantabadgey MacDonald Memorial Hall in Jewnee Street, Wantabadgery. The memorial will be officially opened at 11:00am on Sunday 13th September 2015 by the Wagga Wagga Local Area Commander Bob Noble. The opening will include; a display of modern and historic police vehicles, police command bus, police helicopter, horses and re-enactors. People are encouraged to attend in period 1870’- 80’s attire. Opportunities will be provided to speak to police including the; PolAir – NSW Police Force Airwing, Police Dog Unit – NSW Police Force, Traffic and Highway Patrol Command – NSW Police Force, Women In Policing and Detectives. Interested members of the public are invited to attend and share in this special occasion. For further information or if you have any enquiries please contact: Detective Inspector Stephen Radford 02 69222599.